Aim for about 15–20 user stories, which cover 3 or more different roles. At least 4 of the stories should include some satisfaction conditions to provide more detail or quantification. 1. As a ROLE, I want GOAL so that REASON. 2. As a ROLE, I want GOAL so that REASON. If you are using the VM for both courses this semester (CS120 and CS164), you only need to do this first subsection once. Repeat starting at the subsequent section (Create gitlab project) for the other course. git config --global user.email "YOUR.ADDRESS@EXAMPLE.COM"
Type atom ~/.ssh/id_rsa.pub and wait for Atom to pop up. It should show some text that begins with ssh-rsa AAA.... Use Ctrl-A then Ctrl-C to copy the entire code onto the system clipboard. 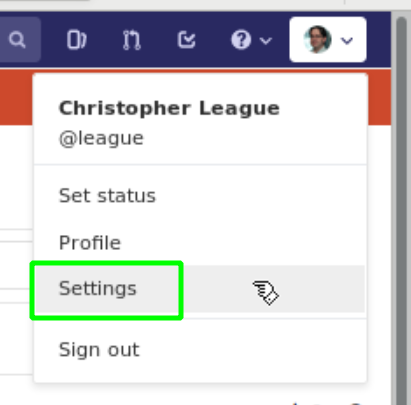 Use ⚙ » Web Browser to log in to your account at gitlab.liu.edu. Select Settings from the profile menu in the upper right, then SSH Keys from the left sidebar, as shown in the screenshots. 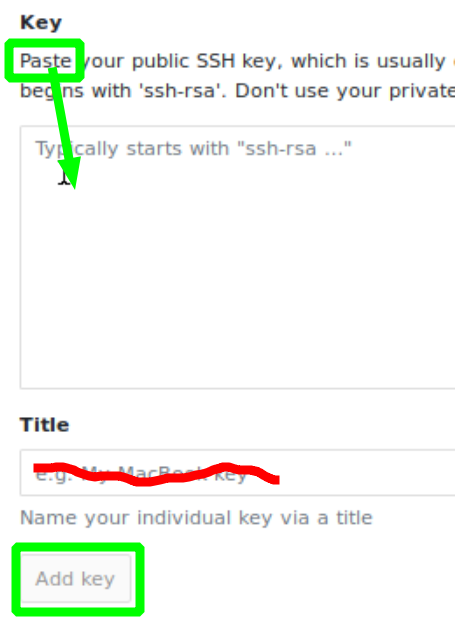 Paste the ssh-rsa code into the big box as indicated, then hit Add key. You don’t need to provide the Title. Still on gitlab.liu.edu, use the upper left menu to go back to your projects list. Click the green New Project button. In the Project name box, enter “cs164”. The Project URL and slug should be fine as they are, and you don’t need a Project description. Keep the Visibility level set to Private. 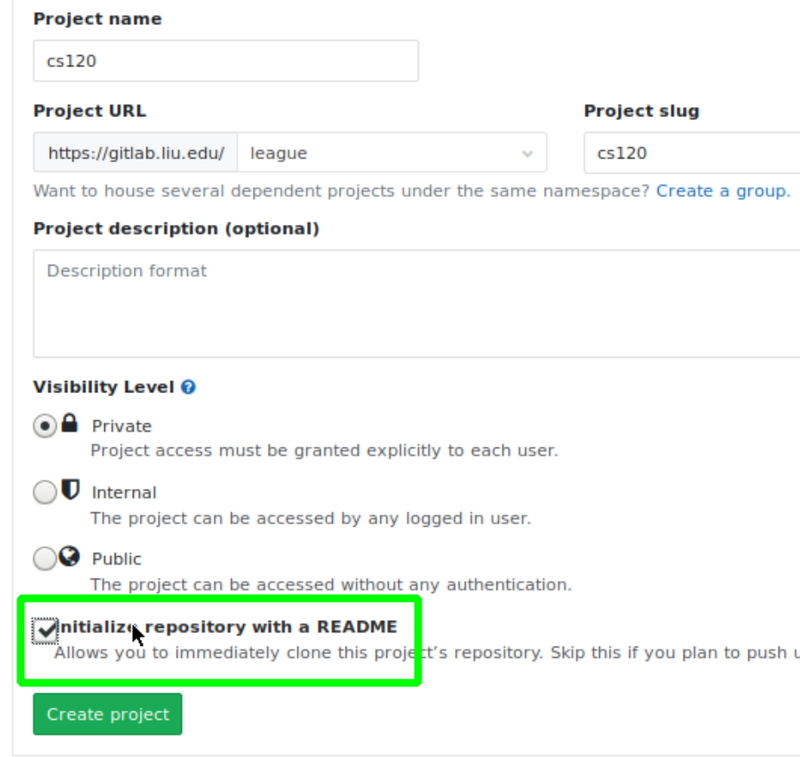 Select the checkbox to Initialize repository with a README. On the page for your new project, look for Settings » Members in the left sidebar. In the Search for members box, type league and select the user named exactly @league, with my picture. Change the role permission drop-down to Developer and then click the green Add to project button. Go back to the main project page (cs164 at the top of the left sidebar), then find the ssh:// URL and use Copy to clipboard. The first time you connect from a new VM, it will probably print a fingerprint and ask whether to continue connecting — type out yes. Switch back to Atom, then use File » Open Folder and navigate to student » Desktop » cs164. Click README.md in the Project file tree to open it. Make a small change to the README.md file, perhaps by typing your name into it. Save the change. Select View » Toggle Git Tab or Ctrl-Shift-9. Hit Stage all in the upper right. Type updated README into the box labeled Commit message and then hit Commit to master. Hit Push to upload your changes to the gitlab server. 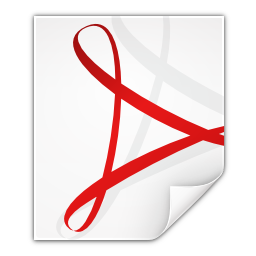 Use ⚙ » File Manager to move your project file(s) into Desktop » cs164. Go back to the Atom Git Tab. It should notice the new file(s) under Unstaged changes. Repeat the same commit and push steps as before. You can use “Submitting project 1” or similar as your commit message. Refresh your project page on gitlab.liu.edu and you should see evidence of the submission.